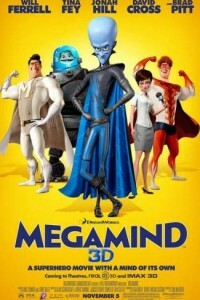 Will Ferrell (who replaced Robert Downey Jr.) is “Oobermind,” – in the movie “Megamind”, originally entitled “Oobermind” – a supervillain who imagines all his dastardly dreams coming true after defeating good-guy rival Metro Man (Brad Pitt), only to find life quite boring without an adversary. To fill the void, “Oobermind” creates a new superhero, Titan (Jonah Hill), who also wants to be bad, forcing Oobermind to switch sides. Tina Fey lends her voice as the reporter tasked with keeping track of the city’s confusing superhero situation.